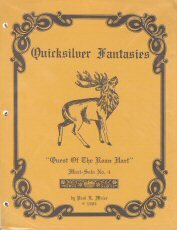 Three-hole-punched, loose-leaf generic solo adventures for Dungeons & Dragons, Advanced Dungeons & Dragons, or any fantasy role playing game. From the early years of role playing games. "The town of Windemere celebrates carnival time each summer. What thrills await you there? Perhaps you'll win the longshot at the Griffon races, or win a prize of gold instead of an expected cheap toy? Will you defend the mysterious lady with the chartreuse hair, or let the cruel mob stone her? Will the Goddess of Love smile upon you, or will you ignore the merriment in favor of revenge upon an enemy? Would you rather forego the secular pleasures of carnival time, and devote yourself to the search for the lost treasure of Term, religious relics dating far into the past? You must journey alone thru the Land of Quicksilver to make these difficult choices presented in Mini-Solo #1! Mini-Solo #1 is designed for play using the rules from the fantasy role-playing game of your choice. It contains 3 mini stories (for fighter, assassin or thief, and for cleric, or other characters wishing to devote time honoring a Deity) which can be replayed many times with different results. 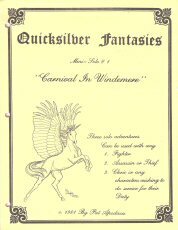 Like all of our solo-adventures, "Carnival in Windemere" features interesting encounters and imaginative story lines. This module is suitable for use with characters of levels 1-4." "Will the wailing ghost of Hailstone Hold stop the freak show in its tracks? Or can you turn its message into the most chilling performance yet? Will the plight of the poor encorcelled freak touch your heart, or does its loathsomeness repell you to your very depths? When the freak show departs, can you track down the horror they left behind to terrorize the Hold? Test your courage by a solo journey thru Quicksilver's Mini-Solo #3, "The Freak Show." This module contains 3 short solo adventures, designed for play using the rules of the fantasy role-playing game of your choice. It is suitable for use by characters of levels 1-4. The scenarios can be played by Paladin (or other fighter of good alignment), Illusionist (or other user of magic) and by a Ranger (or other fighter who enjoys tracking). 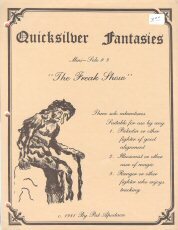 Like all of Quicksilver's solos, "The Freak Show" features interesting encounters and strong story lines." "The Griffon throne is vacant caused by the machinations of the Mad Marvellor. Can you rescue the ensorcelled heir? Loki is on the loose and fomenting trouble in Valhalla. Can you outwit him and restore stability in Wotan's Hall? Pit your skills and intelligence against these, and more, formidable foes! Mini #4 is designed for low-level characters (approximately level 1-4). It has 3 short adventures for a Druid (or other cleric or nature-priest), a thief (or rogue), and a Valkyrie (or other fighter of good alignment)." "Will the message from Heartbreak Mountain change your life? Dare you accept the oracle's enigmatic challenge? 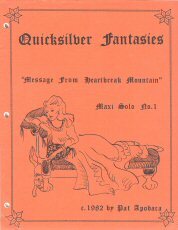 Will Quicksilver ever thrill again to the tunes of Bragi's songmaker, or is his voice forever stilled? Have the alligatormen of the swamps truly kept their peace treaty with Windemere, or did their love of gems overcome their word of honor? Has Lord Blimp discovered a new means of transportation? There's only one way to find out • Play Quicksilver's Maxi-solo # 1! Our modules are designed for solo play using the rules from the fantasy role-playing game of your choice. They feature interesting encounters and imaginative story lines. Maxi # 1 can be played by any character type. Use weapons or magical spells. Replay many times with different results." "Will the fertile plains teeming with life be turned into an arid desert? Will the hoards from the Red Tower swarm out over the land sowing death and destruction? Will the remote and icy Queen of the Pentacles spark green flame at you or will you melt that ice to fire? 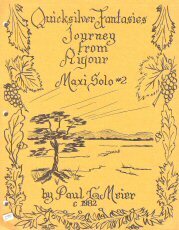 The answers to these and many more questions are inside Maxi #2 "Journey from Rigour". Can you resist? Maxi #2 is designed for mid-level characters (approx. levels 4-6) who cannot use magic. It is ideal for Rangers, Trackers, and Fighters who are concerned with their environment. 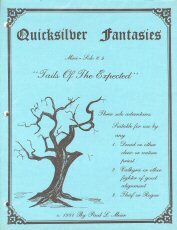 This is a serious journey through Quicksilver for characters of good alignment only." "Long ago, precious relics belonging to the person now known as Blessed Term, were lost or hidden. With the recent discovery of the 'Terrible Tome of Term", some of these artifacts are coming to light. 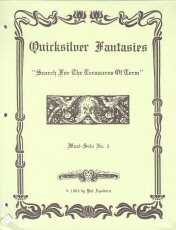 Riddles and clues in the Tome now lead piligrims across the lands of Quicksilver questing for treasure. Clerics want the items for religious reasons, magicians search for new magic, others are interested in material gain. Whatever the reason, will you find yourself joining the Search for the Treasures of Term? This module is designed for solo play using the rules from the fantasy role-playing system of your choice. Maxi #3 can be played using any mid-level (4-6) character type of good alignment. Either magic or weapons may be used in combat." "Zven, the evil warlord, has usurped the earldom of the Roan Hart from the youthful Carras. Will Carras be able to regain his lands from this treacherous villain? And will the ancient rites of the earth goddess be destroyed by the machinations of the Dark Sister? Only with your help will these questions be resolved in Maxi #4, "Quest of the Roan Hart." This module is designed for Solo play using the rules of the fantasy role-playing game of your choice. It features imaginative story lines and well developed non-player characters. Maxi #4 can be used by mid-level characters (4-6) who cannot use magic. It is ideal for Fighters, Paladins, Valkyries, or other warriors of good alignment." "For many years the mighty walls of Castle Sigisman have been empty of all but shadows. The halls of the great fortress have echoed only to moans of the past. Will the Blasted Heath ever be recovered? And can the spirits be driven from their ill-gotten home? The answers must be sought within the "Castle of Sigisman." 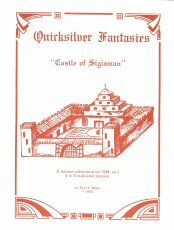 "Castle of Sigisman" is designed for play using the rules of the fantasy role-playing game of your choice. It is ideal for mid-level (level 3-6) fighters, clerics, wizards, rogues or thieves. Any character races may be played. This is a full length multi-player adventure with maps and notes for G.M.'s."